Apple’s recent refresh of their MacBook Pro line has left some Mac aficionados a little underwhelmed. The Touch Bar, Touch ID support, and extra thinness and lightness were all welcome, but the use of last year’s Intel Skylake processors has not been nearly as well received. There are a number of reasons why Apple might have skipped Intel’s current lineup, Kaby Lake, not to mention the simple fact that the latest CPUs simply might not have been ready while the new MacBook Pros were being designed. In any event, the real question is, did the switch to Skylake from the previous generation’s Broadwell processors bear any fruit? The answer is decidedly mixed, as MacRumors reports. MacRumor turned to the ubiquitous Geekbench set of benchmarks to see how much improvement the new MacBook Pro machines might bring in terms of sheer performance. As it turns out, when comparing machines in the same processor class, the newest versions do eke out a slight improvement when looking at the Geekbench 4 multi-core scores. The Core i5-6860U in the 2016 13-inch MacBook Air, for example, scored 6,970 in Geekbench, compared to the 6,782 scored by the Core i5-5287U in the 2015 13-inch MacBook Pro. That is a very nominal three-percent increase. 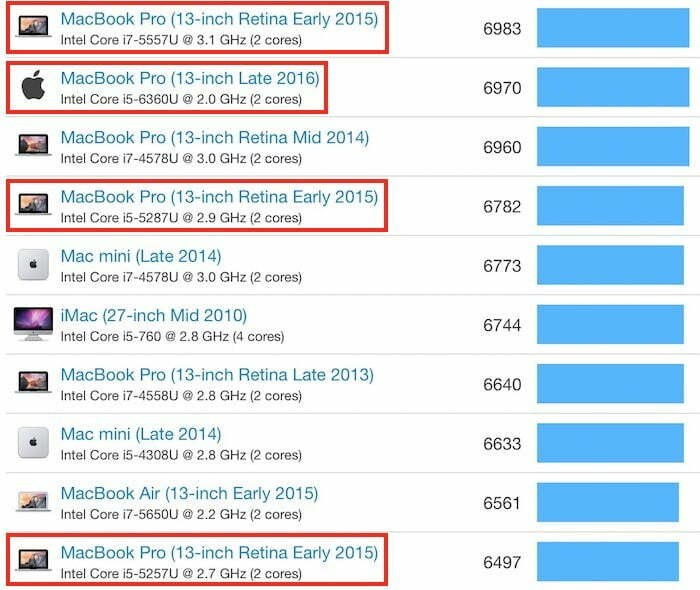 MacRumors did not list a score for the 2016 Core i7 model and so the highest score in the roundup was achieved by the Core i7-5557U in the 2015 13-inch MacBook Pro. While the new MacBook Pro model does not provide any significant performance improvements, its use of the 15-watt Skylake CPU versus the 28-watt Broadwell CPU does provide some advantages in terms of energy efficiency. As MacRumor notes, the new models should enjoy battery life with 54.5-watt batteries as compared to the previous models’ 74.9-watt batteries. Of course, that also indicates Apple’s determination to make the new machines so much thinner was a compromise against potentially much-improved battery life. There are a number of reasons to pick up this year’s MacBook Pro, including that innovative input mechanism, the Touch Bar. Improved performance and battery life, however, are not among those reasons, and so anyone thinking about upgrading an older MacBook Pro should be sure to consider exactly how much additional performance they are looking for.